Lacrosse is played at a quick pace mixing various aspects of hockey, football, soccer, and basketball. Where basketball is played 5 vs 5, Lacrosse is 6 v 6 (+goalie). With the exception of the goalies, players can only touch the ball with the crosse, or stick. Teams advance the ball toward the opponent’s goal by running and cradling it or passing it to a teammate. If given the opportunity, the offense attempts to score during the fast break, before the defense can set up. 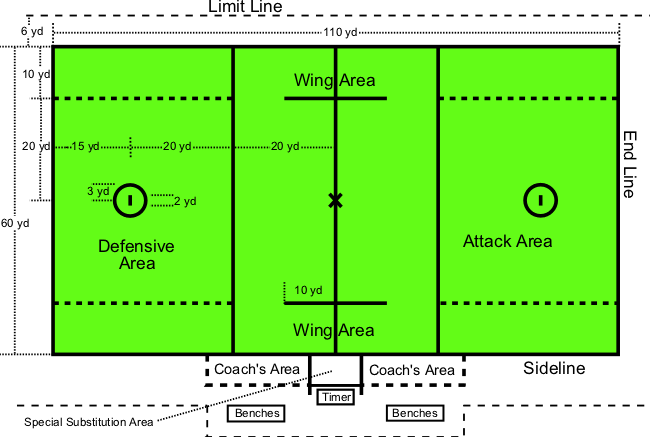 During the set offense, when players are near the opponent’s goal, proper spacing between players and balance in formation allow teams to execute plays that are designed to exploit defensive weaknesses. A player with the ball may attempt to drive during an isolation play, or feed the ball to an open player. Players without the ball are constantly cutting and setting picks to become open and create scoring opportunities.